Whether your company is a small local B2C business or a large B2C company, it’s worth paying attention to your Google My Business (GMB) listing. This means that most businesses can (and probably should) have a GMB listing. A Google My Business listing is a free source that can direct more visitors to a business’s website, almost no matter what type or size of business. For salespeople who regularly send out long form proposals that contain pricing tables, there has always been a conundrum. That is, a pricing table within in a document can’t be dynamically updated as easily as a spreadsheet table. The word processing capabilities within a spreadsheet are limited. Often, a proposal’s pricing table is revised several times before the final version of a proposal is sent to the prospect or customer. This can require manual effort. Either the new bottom line in the document table needs to be hand calculated when line items are changed — or the spreadsheet table must be re-copied/pasted a into the document. The current G Suite pricing is different than it was when G Suite was known as Google Apps for Work. Prior to December 6, 2012, Google offered a free business version of Google Apps. Businesses that signed up for that version are grandfathered at no cost for up to 10 users. Google still offers free versions of G Suite to qualified educational and government institutions as well as to qualified nonprofit organizations. For for-profit businesses, G Suite does come at a cost. Chromebook runs on Google’s lightweight operating system, Chrome OS. Chrome OS is so lightweight that it doesn’t support running traditional locally installed business applications. This is changing to to some degree, as several recent model Chromebooks support installed Android apps. Example models are the Acer Chromebook R 11 Convertible and the Google Chromebook Pixel . Many developers will need to make changes to their Android apps in order to fully support Chrome OS. Even if an app is made compatible with Chrome OS, it may not be as robust as its Windows or macOS counterpart. Chromebooks ship with under 32GB of local storage. But this is more than enough space to run multiple Chrome extensions. Chrome OS updates are easy and fast to apply. This makes Chromebook an attractively secure choice in light of recent ransomware attacks, in which older unpatched operating systems were exploited. [Read more…]Should Your Business Be Deploying Chromebook? The adoption of G Suite began with small to mid-sized businesses. However, the shift to G Suite for enterprises is ostensibly underway. At the March 2017 Google Cloud Next Conference, both Colgate and Verizon talked about their move to G Suite. Colgate-Palmolive has moved 28,000 users to G Suite from IBM’s legacy Notes and Domino systems. Verizon is planning to move 150,000 users to G Suite. 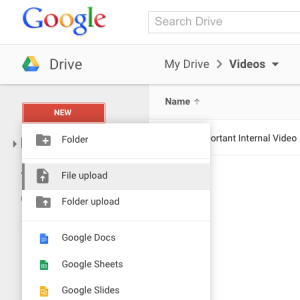 If your organization uses G Suite, you may have discovered that when you upload a video to Google Drive, it’s not simply a stored file — the video can be played inline. What’s more, Google Drive uses the YouTube engine to play uploaded videos. When playing a Google Drive video, the interface has the appearance of a slimmed down version of the YouTube player. Many CRM users, especially salespeople, live in Gmail. Because of this, a number of CRM vendors have developed Chrome extensions that provide access to CRM functionality within consumer Gmail and business Gmail (G Suite). A Chrome extension is a software program that adds functionality to the Chrome browser. Historically, Chrome extensions have had little to no user interface. In fact, the original intent of Google’s developers was for extensions to be minimalist. From a user interface perspective, many extensions are no more than a button on the address bar. As an example of basic functionality of a CRM for Gmail Chrome extension, a CRM user can search for records, edit records and add records — all without leaving Gmail. Some CRM vendors have taken their Chrome extensions to entirely new levels. What is Google Sheets and How Does it Work? Google Sheets is one of the productivity applications that’s included with free consumer Gmail and with G Suite [for business]. It is a cloud based spreadsheet application. No desktop software is needed to create and edit spreadsheets. Spreadsheets are stored in the cloud, on a virtual drive called Google Drive. Google Sheets can be used for everything from basic calculations to sophisticated data analysis. [Read more…]What is Google Sheets and How Does it Work? How Does Google Docs Work? Google Docs is one of the productivity applications that’s included with free consumer Gmail and with G Suite [for business]. Google Docs is a cloud-based word processor, which means that no desktop software is required to create and edit documents. Documents are stored on Google Drive, which is the cloud drive included with Gmail and G Suite. Google Docs has all the core capabilities that can be found in traditional word processors. It also has a number of capabilities that relate to the fact that the documents are stored on a cloud drive (vs. on one person’s desktop). So, how does Google Docs work? Here are just a few of the capabilities. [Read more…]How Does Google Docs Work? When a small business owner or manager decides to make the move from free consumer email addresses (e.g., jake2874@comcast.net) to custom email addresses (e.g., jake@abbottsolar.com), there are a number of business email options. Aside from Microsoft, two of the most popular business email providers are Rackspace and Google. As service providers, Google and Rackspace differ in many ways. However, they do overlap in a couple of areas. There are two ways in which a G Suite user can have an unlimited number of inbound email addresses associated with their G Suite account. We’ll refer to these ways as “dimensions”, as they can be used in combination. The first dimension of unlimited email addresses are email aliases. Aliases are assigned to a user account by a G Suite admin. An admin can assign multiple values to what is technically called the Local-part of the email address, or the part before the @ sign. In the following example, you will see that Lou’s default email address is lou@yourcrmdemo.com. Lou must use this address to login to her email account. There are more similarities between free, consumer Gmail and G Suite than there are differences. In fact, G Suite can be viewed as a multi-user version of consumer Gmail. When a single user platform becomes multi-user, an administrative layer is needed for tasks such as adding and deleting users, creating groups, assigning apps and managing security. Fortunately, adding users to G Suite is a straightforward process for an admin. The creator of a G Suite account is a Super Admin by default. One or more admin roles can optionally be assigned to any user. One of the admin roles is called User Management Admin. This role allows a user to create, delete and update users — so, someone other than a Super Admin can be responsible for adding and removing users. While Google has its own mobile phone and tablet operating system, the company needs to remain mindful of the fact that millions of consumer and business Gmail customers are iPhone and iPad users. In fact, over the last 30 days, 63% of the mobile & tablet visitors to this website, as reported by Google Analytics, are iPhone or iPad users. For years, Google has offered iOS apps for Gmail, Calendar, Drive, Docs, Sheets, Slides and more. However, until recently, the Gmail app had not been updated since December 4, 2012. New Google Sites rolled out to all G Suite customers in November of 2016. The original Google Sites, now called “Classic Google Sites” was released in 2008 after the acquisition of JotSpot in 2006. The product did not see much in the way of enhancements for many years. The new Google Sites was built from the ground up, which means not only a modern set of design components and full device responsiveness, but an app that fits in much better with the rest of the G Suite offerings. The topic of email security is all too frequently in the news. On September 22, 2016, the story broke that data associated with 500 million Yahoo! email accounts had been stolen in 2014. There are many reasons why hackers spend their time trying to infiltrate email servers and email clients. Sometimes it’s to steal intellectual property. Google Analytics Event tracking allows you to incorporate visitor activity from many different sources within Google Analytics. Once the information is in Google Analytics, as we covered in the previous post, comparative visualizations can be created in Google Sheets. Here are five Google Analytics event tracking examples. You can use these to measure the effectiveness of your marketing efforts. This is all predicated on the fact that you are using the Universal Analytics tracking code. One of many benefits to using G Suite is that G Suite users with access to their organization’s Google Analytics account can easily share specific slices of Google Analytics data with their co-workers. The Google Analytics Add-on for Google Sheets lets a Sheets user who has a Google Analytics login create a variety of comparative visualizations within Google Sheets. Google Slides allows two or more people to collaborate in real-time on edits to an online presentation. For this to happen, a Google Slides presentation creator needs to first share out his or her presentation with one or more people.